DYK #1: Did you know that you can have the Admissions Blog delivered to your inbox whenever there’s a new post? Yes, indeed. Save yourself precious seconds each day. All you need to do is look over to the left-side panel on this page. 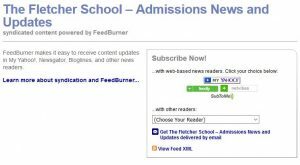 See where it says “Subscribe to Admissions News & Updates via RSS“? After you click subscribe, you’ll be delivered to a page where you can decide how to subscribe, and you’re not limited to an RSS feed. Email is another option. Go for it! No more checking the blog site each day to see if we’ve answered your question on what to include in your application essays. DYK #2: Did you know that, if you would like to participate in an evaluative interview for September 2018 enrollment, you should arrange your appointment now? That’s the way we do it here — interviews before you submit your application, and the interview program runs only until December 8. Don’t wait until the last minute to schedule your interview! DYK #4: Did you know that there are still plenty of opportunities to connect with us coming up on our Calendar of Events? Though Admissions travel is gradually winding down, there’s still an APSIA tour through Asia, information sessions both virtual and on campus, interviews on and off campus, coffee hours on campus, and more! Come see us or connect with us soon! ← Michael Dobbs in debate on Brexit today!